My best friend died today. Lawrence Frederick Cohen, better known by his stage name of Larry Fredericks, was 77 years old when he passed away. He was hospitalized in May for a back injury and sadly saw his health deteriorate significantly over the past few months. Last Friday he was rushed to St. Mary’s with internal bleeding and a variety of other issues, admitted to ICU and from there things went very fast. It is still difficult to process everything. Larry was a loving husband, father, father-in-law and grandfather. A veteran of 40 plus years in the broadcast and media business, he served as my role model growing up. Larry was one of the original writers for The Suburban Newspaper, penning the Sports Final column. He continued to contribute to the paper until very recently. His golden voice made him a popular figure on Montreal radio for decades, with the former CKVL. He covered professional sports for United Press International, served as the public address announcer at McGill University football games and volunteered in many capacities for the City of Côte Saint-Luc. That included coaching the hockey teams of my brother and I. For the last number of years we worked on the Cummings Jewish Centre for Seniors Foundation Sports Celebrity Breakfast together as co-emcees. A number of health setbacks forced him to miss a few editions. But last March, there he was before the microphone helping me introduce our star studded group of guests. 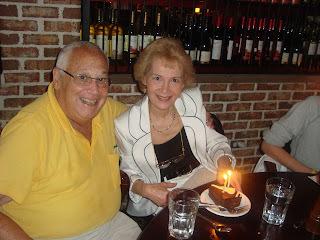 Larry and my mom at their 50th wedding anniversary three years ago. For two years we actually co-hosted the Montreal Expos pre and post game shows on the old CIQC Radio. These were proud and exciting moments for all of us. Sports produced a deep bond between Larry, myself and my brother. Even sister Lisa expressed some interest from time to time. My mother Elaine was a saint, taking care of three kids many evenings while Larry was out covering games, in an effort to bring in some additional revenue at home which he would put towards fun summer vacations. See Brian Wilde's tribute on CTV Sports. I grew up begging my dad to let me work with him in the press box . He made sure we had tickets for all of the games and every now and then he would use his connections to get us special access to the players. “When you are 18 and in CEGEP I will let you come cover the games with me,” he promised. Larry lived up to that big time. There I was, in the Expos press box for opening day in 1981. He got me a break to write for The Suburban, The Monitor and then at The Sunday Express. His volunteer work in Côte Saint-Luc prompted me to do the same and contributed my desire to run for city council, which I did successfully seven years ago. He was proud of the work I did at the English Montreal School Board and dropped by the office on a regular basis just to say hello and chat with my colleagues. We spoke almost every day. Several times in fact if there was something significant going on in the local sports scene. The man had an incredible sense of humour; personable as can be. Everyone wanted to be his friend. As a father he was always there when I needed him. “Be careful,” was the way he ended all of our phone calls. There are so many pleasant memories I have about him. Today he was taken from us quicker than we ever imagined. I will have more to say as I continue to collect my thoughts prior to his funeral at Paperman and Sons on Wednesday at noon. Here is a video of Larry's last appearance as co-emcee at the Sports Celebrity Breakfast in March. It is a sad day as we remember a great Man in our community, I have always loved Larry for his voice in amateur sports,I will never forget him watching over us at Wentworth park.